7.15am west side looked knee to waist from the road. 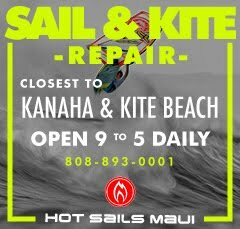 Lahaina has bigger sets as usual and clean conditions. Ukumehame wasn't windy, Olowalu light offshore, but once again flat when I drove by. Mostly 12s energy, but once in a while there might be inconsistent longer period sets. Didn't look at Hookipa. First of all, thanks a lot to blod reader Alex for the much appreciated donation through the Paypal button on the right. Lahaina side provided some really good waves again yesterday morning. The photo of the day is a frame grab from a video that Jason Hall posted on Instagram. I wish I could share the whole video, but they make it hard to embed. It is a set at Olowalu, which I referred in my early morning beach report as "light offshore, but flat when I drove by". 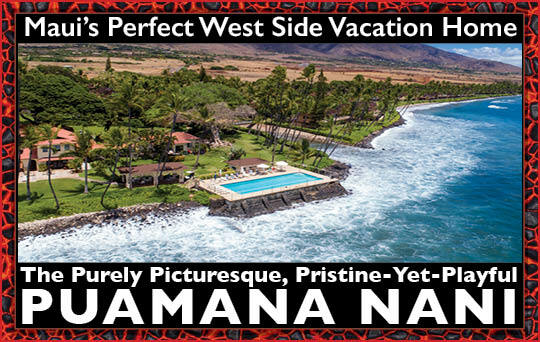 1) my west side reports are based on what I see from the road while I drive towards Lahaina. I do not stop at each spot and watch it for 10-15 minutes. 2) unless I specify an upper limit (like up to head high), bigger that waist high means bigger than waist high and that can be belly high or double overhead! 3) I tend to be conservative. I hate to create expectations of a particular size and then have you guys drive all the way and find it smaller. Also, when I say it's waist high, I mean that most of the waves are waist high. But that means that there's also bigger sets, of course and every single time, even if I don't specify that. In other words, take those reports with a grain of salt. And, I write this against my interest of generating traffic for this blog, if your connection speed allows you, ALWAYS look at the webcams too. Still energy from the south at the outer buoys in the 12-13s range. That is a period that many spots of the south shore prefer over longer ones. Let's take the popular Thousand Peaks as an example. Over there 2f 18s would make for shoulder to over head high closeouts. 2f 12s would make knee to belly high peeling a-frames. This also gives me the opportunity to repeat one more time that the size in feet indicated by the buoys has NOTHING TO DO WITH THE HAWAIIAN SCALE. The Hawaiian scale is something so inaccurate, ambiguous, unscientific (and overall dumb) that I don't even want to waste more of my time commenting on it. Guessing the size of the breaking waves at a particular break upon the readings of offshore buoys is something that requires a bit of local knowledge. Not that difficult to build, IMO. You just look at the buoys and at your spot every day for two weeks and you have a pretty good idea of what I'm talking about. I reported also that .7f 18s reading at the W buoy, because I believe it's an indication of a new long period pulse FROM THE SOUTH, that both Surfline and Pat Caldwell predicted based on the WW3 output. I explained many times why the direction appears to be from a completely different direction, but I'll do it again for the benefit of the new readers (and because I have the time this morning, since I have a lesson that only starts at 7am). The W buoy is also reading 6.7ft @ 8s from 73° (ENE). That's a hefty windswell that I don't report because it isn't "significant" for the south shore waves. It doesn't make waves for the south shore. If anything, it might interfere with the shape of south swells in some spots, introducing a wobble in the lip, but in this case the Haleakala offers plenty protection from it, since it comes from a direction of 73 degrees (you can definitely rely on that direction a lot more). The presence of that heavy almost 7f oscillation every 8 seconds, makes it very hard for the buoy to detect the direction of a much weaker and inconsistent open ocean ground swell like 0.7f 18s in this case. The indicated direction is hence completely wrong. 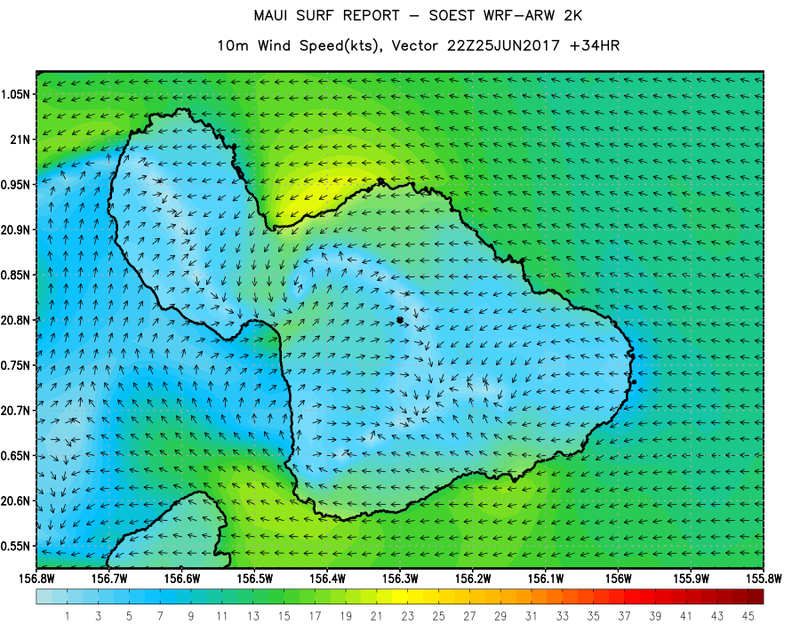 If there was such a swell from 45 degrees, it would most definitely appear at buoys like North or Mokapu (and it doesn't). Also, there was absolutely no fetch from the NE in the past few days that would make such a long period swell. Sorry about the river of words, I got a bit caught up in the explanations. I hope some of the readers appreciate it. Wind map at noon. Once again not particularly strong and that's because of the reason explained below. I explained that to a Hi-Tech rental customer just yesterday. Based on the Windguru table below, he thought that Friday was going to be the windiest day of his stay. Instead I told him to hover with the mouse over the arrow that indicated the direction and get a number. In today's case, the direction shows 60 degrees and that doesn't get particularly amplified by the Haleakala. So those 16-20 knots might easily remain such. Take Sunday instead. The direction is around 90 degrees and that can potentially make those 9-12 knots become 20+ and very gusty. The more east in the offshore direction of the trades, the more they get amplified and become gusty on the north shore. 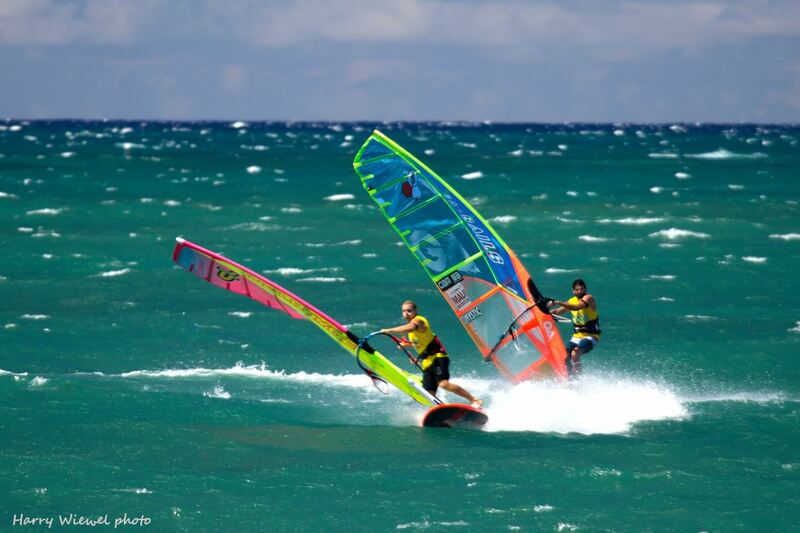 When you pass 90 degrees, they only get amplified east of Hookipa and are not goot for sailing downwind of it. Another important thing you want to look at on that map is the cloud cover (red circles). The clearer the sky, the stronger the thermal component will be. North Pacific only shows the windswell fetch. With a good timing now the South Pacific only offers a Tasman Sea fetch, while the SSE one has become totally negligible. Some clouds, but nothing major. 6am west side looked knee to waist from the road. Lahaina has bigger sets as usual, but with a bit of north wind picking up as I type. Ukumehame wasn't windy, but looked like it could start blowing any time. Olowalu light offshore, but flat when I drove by. Didn't look at Hookipa. Day off yesterday and three sessions in the water: shortboard, longboard and wave sailing. All so equally fun that I couldn't pick a favorite. Thanks to all the toys I carry with me, this is the summer I'm having the most fun in my whole 16 years in Maui. 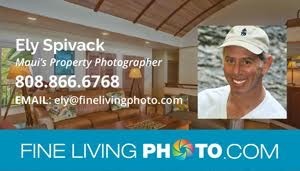 I took some photos at Hookipa at sunset, this is Cookie in a last minute spotted hand held shot, standing by the rail. This one with Vicky (second day in a row on the blog!) shows the size of the bigger waves. This kid is foiling the inside reform almost every day. In this case the foil is about to pop out of the water and that's not a good thing, since he'll fall forward right after. Pavils had some, but choke people as usual. Still energy from the south at the outer buoys, another drive to Lahaina is the plan before a morning working shift. Check webcams and beach report for size and conditions. Still plenty NE energy at Pauwela (but gone at the N buoys, might be the last day). Sorry if I called it small and ugly in yesterday morning's beach report, but that's how it looked from the Lanes turnaround. It might have been not that small, but it sure was ugly. At least for my standards. 15(9-21) from 66 is the wind reading at 4.15am and I'm gonna call it ugly again, without even seeing it. Yesterday the wind ended up being a bit stronger than predicted by the customized SOEST WRF-ARW model (link n. -2), so this morning I also checked the original, thinking it would be more updated. But as you can see, it's the same exact run (unfortunately 34h old), just a lot more legible thanks to the much clearer graphics implemented by the friend that runs the Meteogram website. North Pacific shows a very weak NW fetch and the windswell one. 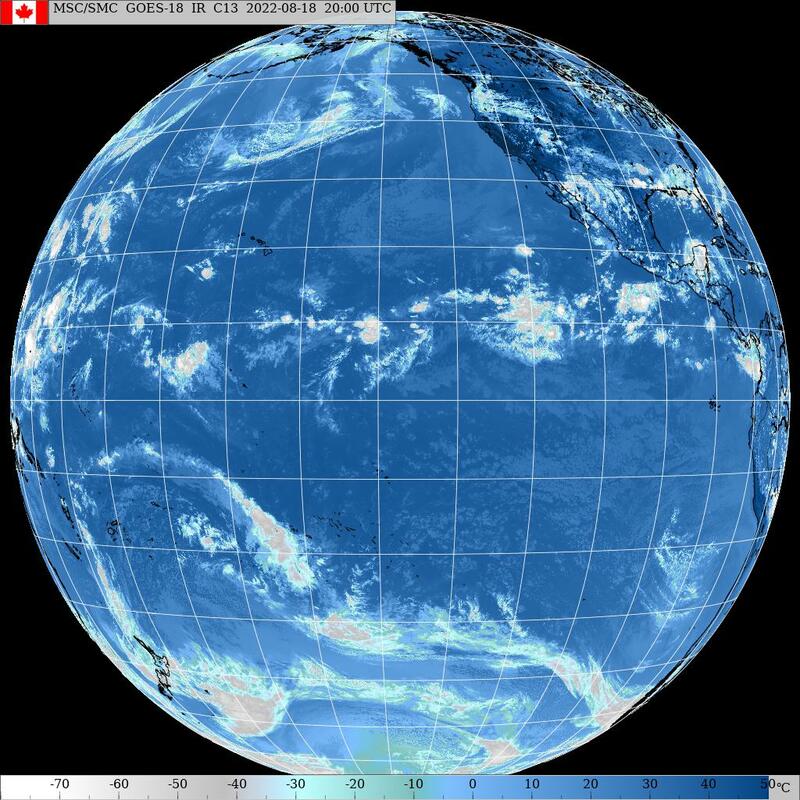 South Pacific shows the ESE fetch that has been there for at least three days now. Not too exciting, but enough to keep the flatness at bay in a week. Classic trades sky again and another stunning day is on its way. 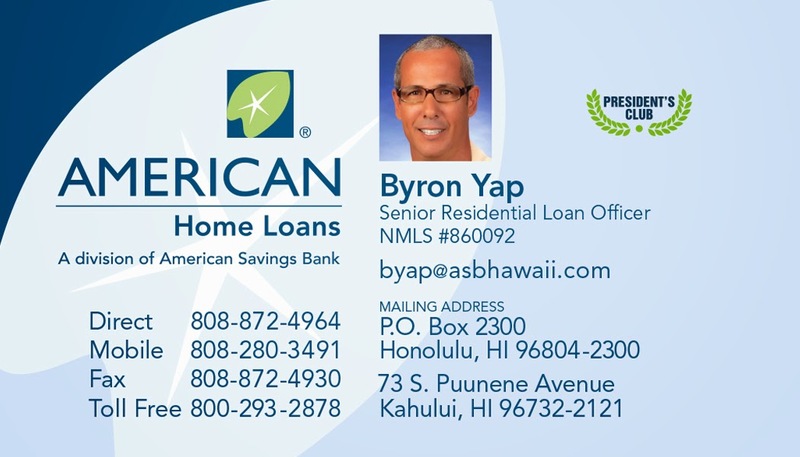 This is a video from Alex and Carla Aguera documenting the action at the recently held foil contest in Oahu. If you judge it with the eyes of the surfer, it looks kinda lame. But that's a mistake, since the fun in this case doesn't necessarily comes by staying in the critical section and hitting lips. It's a great feeling no matter what kind of wall you're riding. Definitely a sport that is more exciting to do than to look at. 6am west side is knee to waist but with a nice period of what seemed 14-15 s. Lahaina has bigger sets as usual, but the no offshore magic this morning. Shape was a little wobbly all along the road, Ukumehame was windy. Hookipa looked small and ugly. The dawn offshores in Lahaina lasted longer than usual yesterday morning and the quality of the waves was through the roof. I saw several 9's. Unfortunately I couldn't take full advantage of them, because I was on my SUP since I felt like giving my prone paddling muscles a rest, but it was a fantastic session nonetheless. Second session wasn't nearly as good as the onshore flow was on it, so I quickly went back to the north shore and sailed Hookipa before work at 2. I'm good at packing I said... that also applies to packing fun activities in my day. Not sure if this photo is from yesterday or the day before. For sure the waves on the north shore came down a bit compared to Monday. Photo by Andy Bridge. Trades are increasing, so is the windswell and that makes all the readings at the outer buoys veer more and more towards the east and it's hard to detect the southerly energy. Those are the two I feel like reporting and that's great because the good sets yesterday were definitely the 15s ones, so a couple of feet of that component still in the water is good news again. Check the webcams and my beach report for size and conditions. Since I highly doubt that any of you guys scrolls down to the posts of 7 days ago to check the fetches that generated the southerly energy, here's a collage of four of those maps starting from June 21. There's waves today because there were fetches sometimes in the past. And if you start to observe them and correlate the size and periods with the fetches that generated them, you'll learn to do your own prediction next time you see a fetch. 98% of the surfers don't care and just stick to whatever number of feet their wave forecast app says on their smart phones. No shame, just a much easier, much less complete/interesting approach that will make them miss sessions here and there. Specially when there isn't a "conclamated" swell in the forecast. I reported the N buoy reading too to let you guys guess that the NE energy should continue also today, but with the mix of windswelly periods at Pauwela and the trades predicted to increase, the conditions will be pretty horrible. At least for my taste. Wind map at noon shows less wind than the other models on windguru. This is going to be a good test for this model. North Pacific offering pretty much only the usual windswell fetch. South Pacific not doing too much better today. With barely 30 knots in a very small pocket, that fetch is not going to send us much. Trades morning sky and another stunning day is on its way. 8.15am conditions still pristine in lahaina, and when the big set comes it's actually shoulder to head high. 5.45am west side is flat to knee high, with clean conditions everywhere. Lahaina town has some waist high sets. Didn't look at hookipa, but my guess is at least shoulder high (and poor shape). After two longboard sessions (second one was a 9, knee to waist high with some absolutely perfect sections at one of my favorite break with only another guy out) and a total of 5 hours surfing, yesterday I thought I was completely done when I called my friend Jeff Henderson on the way back from the west side. 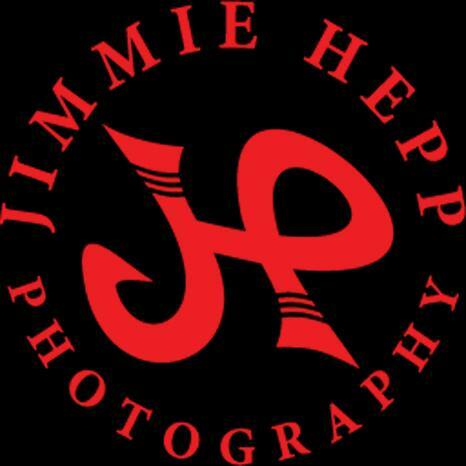 "Hi Jeff, are you at the shop? I have a couple of foiling questions for you"
"I will be later, but you should go sailing instead. There's waves on the north in June!" 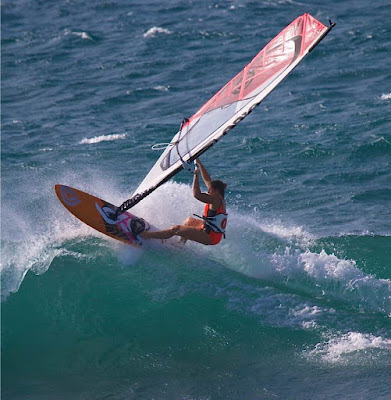 "Oh, I guess you're right..."
So I did and I added one hour of wave sailing at Hookipa. Not my favorite conditions, but heaps of fun with solid head high waves and the occasional logo high bomb. My shoulders are slightly sore this morning, but I'm up early no matter what and gonna do it all over again. Got to make hey while the sun shines, but with a car loaded of all kind of different toys like this, the sun shines everyday in my sky. Inside: a 9.4 single fin nose rider, a 8.0 longboard, 2 shortboards, 2 sails, boom, mast and a foil. On top: 2 SUP boards and the windfoiling board. Very symbolically, no room for humans other than the driver in this configuration. No need either, I'd add. Enough auto-celebration, here's one for the ladies. With a body like that, you look cool even when you fall. Here's one for the guys too. Still way too windy for quality surfing at sunset, couldn't find a decent shot other than this wipeout in the lip. Outer buoys still showing some energy from the south with a mix of different periods. We'll take them. After a week of big waves, this week is going to be knee to waist high in average, but far from flat. 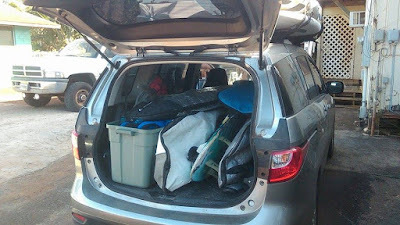 And I'll keep driving to Lahaina in search of clean waves. Easy task, as most mornings over there usually offer them. Check the webcams and my beach report for size and conditions. More energy from the NE today, possibly on a slight decrease. The wind at Hookipa is blowing 9(4-14)mph at 4.30am and I'll leave that behind in the dark. North Pacific shows pretty much only the windswell fetch. South Pacific shows a SSE fetch with a tiny section of 30 knots. Enough to keep the flatness away (in a week). Morning sky looks good as usual and another stunning day is on its way. The weather has been unreal in June. Even in the middle of the day, it's 86F (30C) and it still doesn't feel hot thanks to the trades. I can't even remember when was the last time I used the AC in my car. Just watched this video by my favorite human on Earth Dr. Greger. Everytime I wait in line to pay for my groceries, I observe what the other people are buying and what Dr. Greger is saying appears absolutely evident. The public must not know how bad is the stuff they buy and eat, otherwise they wouldn't do that. Or, would they? 6.30am hookipa was shoulder high and poor shape. West side is waist high and clean everywhere, lahaina town has occasionally bigger sets. Yesterday morning the conditions in Lahaina were pristine again and I saw (and rode) a few more 9's. I got a shoulder high and clean report from Hookipa too. 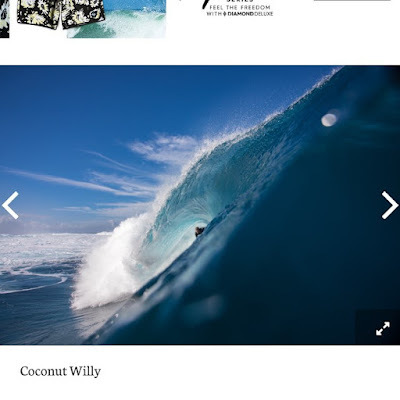 This instead is Maui's Coconut Willie in Tahiti in a picture featured by the Surfers magazine website. How's that lip? After work I tried a formula board with the foil. Once again, with the box all the way at the back (where the windsurfing fin normally is), the feeling was of a slalom setup and I didn't particularly like it. With the box further forward, the foil starts foiling much earlier and it's much more maneuverable. More like a wave board, really. 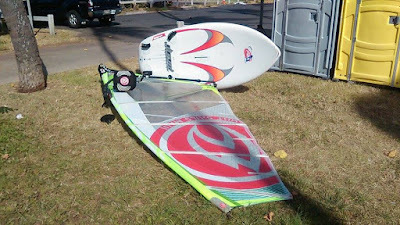 I'm still looking for a board to dedicate to windfoiling and I'm starting to realize that whatever I find, I will have to add a box in front of the regular fin one. That's a lovely $250 extra. The southerly energy at the outer buoys is finally declining this morning after 9-10 days of pumping waves. There will still be waves on the south shore, but smaller than yesterday. A new small long period pulse is predicted to slowly pick up later in the day, but it's more of a tomorrow's deal, if it materializes. Check the webcams for today's size. 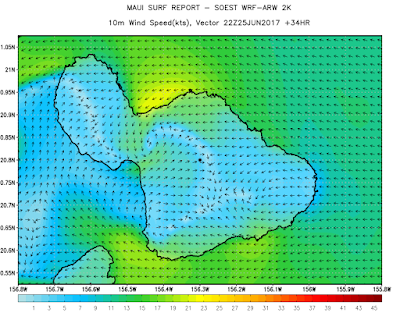 Solid reading at Pauwela, if the wind won't be too strong, Hookipa and all the easterly exposures could be fun at sunrise. In the meantime, the sensor is reading 5(3-7)mph at 4am and below is the wind map at 6am. North Pacific shows a very weak and not well oriented NW fetch (won't do anything for us) plus a NE fetch. South Pacific shows a very weak Tasman Sea fetch (won't do anything for us either) and a quite wide SSE to SE one. Classic trades morning sky again. Even if those clouds to our east move over us, I'm still calling it another stunning day. 5.30am west side has waist to chest high waves. Lahaina has still occasional head high sets. Wind is calm everywhere. Another fantastic day of surfing on the south shore yesterday. The conditions in Lahaina were pristine in the morning. I didn't see any 10's, but I saw a couple of 9's. These are some photos I took at Olowalu. This little kid was catching the white water on the inside all by himself and deserves a photo. The waves weren't the only beautiful thing out there. I'm selling this 7.7 single fin egg. 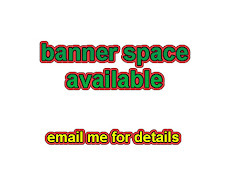 This is the craigslist page with the ad. I priced it $250, but only for the blog readers and only today from 9 to 2, I'll sell it for $200. Come grab it at Hi-Tech if you want it. Epoxy and extremely light with a matching color fin. The bag is extra and optional. Still energy from the south (the amount of east is impossible to quantify due to the influence of the windswell, but we know there's some if you remember the fetches). There will still be waves. Check the webcam and my early morning beach report for size and conditions update. Because of the high tide, Hookipa looked very small at sunset again, but this morning there should be some waves. The wind is calm at 4.30am and in the silence I heard a set breaking. My friend who runs the Meteogram website couldn't stand the mega zoom of the map I posted yesterday (can't blame him, the thing was horrible) and offered his much better graphic version and the result is great. This is noon today and the only problem is that the prediction is 34 hours old. It's not automatically updated yet, but he's working on that. We'll see, in the meantime, it's sure a lot easier to read and it looks very promising. North Pacific shows a couple of fetches, the most relevant of which is the NE one. South Pacific shows some fetches too, the most relevant of which is the SSE one, with patches of 33 knots. 5.30am lahaina has chest to head high waves and clean. Too dark along the road for a report, but the wind looked calm. Yesterday was another day of waves on the south shore. Conditions weren't as pristine as the day before, but I managed to pull off two sessions before an afternoon work shift. No time in between to take photos from land, I couldn't stand the thought of another day without shot of the day, so I pulled the gopro out and put it on my only board with a mount on the nose. I like that angle much better than what you get with the mouth mount. I'd like it even better if I was a better surfer... I thought this turn was totally radical when I did it! Btw, thanks to that surfing hat (available for sale at Hi-Tech), I've been on a zero sunscreen program for more than a month and didn't get burned once. Numbers at the outer buoys still up, but on a slow decline. 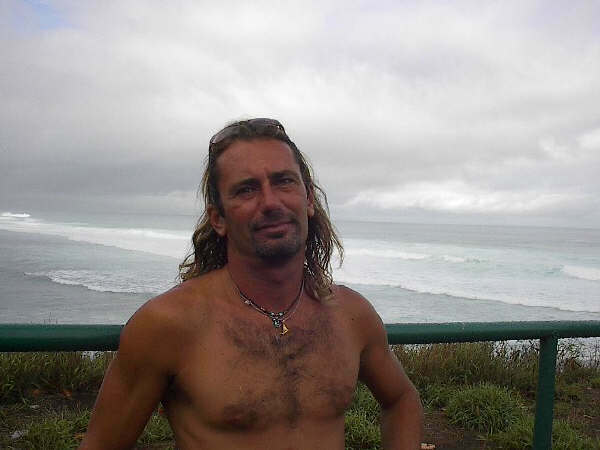 This is day 8 of a great weak of southerly swells and I'll do the drive in the dark again. Got to make hey while the sun shines, since next week is not going to be as good as this one, even though there's small but long period episodes in the forecast, the first one of which should happen Tuesday. I'll post the usual beach reports from the road, but you guys also check the webcam please. Sometimes while dedicating 3 minutes of my time at doing that I wonder:"why am I doing this when they can just watch the webcam?". Anyway, 3 minutes is no big deal, I'll keep doing them in the hope that someone appreciates them. Watch out the negative tide that in Lahaina today will be at 9.11am as shown below. That's another good reason to hit it early before it happens. That is not too bad of a reading at Pauwela. Despite that, Hookipa looked kinda flat at sunset, but the high tide didn't help. Should be something in the morning, maybe up to even head high at Pavils, but overall nothing to be too excited about. Yellow is 15-20 knots and orange is 20-25, so this model shows plenty wind at noon, specially down the coast of the north shore. Instead, even the notoriously generous NAM3 model at the bottom of the windguru page only shows 13-18 mph. The difference is significant and I'll keep an eye on the wind to see which one is right. North Pacific shows small, weak fetches. Better fetches from the south, but with a longer travel distance. 35 knots in the lower part of one of them, but in a very small section. Classic trade sky again and another stunning day is on its way.